I have to admit, it’s really nice to be able to report good news. I felt like I really had some downer posts at the beginning of the week, both with Weighty Impressions and my post-op pneumonia. 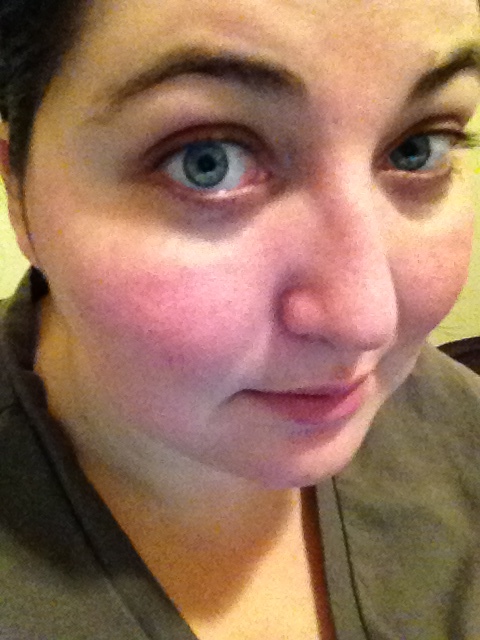 I’m starting to see a little indent in my cheek…can you see it? Not everything is hunky dory though. I vomited today. It’s the first time since I’ve had surgery. I’m cleared to eat fresh fruit, but it’s not digesting so well. My tiny watermelon chunks come out like mashed watermelon, even though they are well chewed. I was craving applesauce, and had a bunch of apples that needed to be used, so I decided to make my own. I peeled, cored, and chunked 10 apples, and pureed it with cinnamon and vanilla extract. It came out delicious, and I had about 2 tablespoons. Unfortunately, I lost it within 5 minutes. I need to be careful to limit my sugar intake, including fructose (fruit sugar). Maybe my body will be ready for it in a few weeks. I went to Cafe Rio for lunch, and was happy to eat my beloved pork barbacoa without any problems. Really body…pulled pork over fresh applesauce? One of the worst things I’ve dealt with since surgery is the hiccups. It happens up to 10 times a day, and it’s usually from drinking water too fast. When I get them, it feels like my insides are being ripped apart, which is not cool after abdominal surgery. I found out that a spoonful of peanut butter helps better than any other remedy, but I have to be careful to not eat too much. Yesterday I uploaded this video to YouTube. Ankle 11.5 (12.5) – and so much less swollen looking! It really is ridiculous how funny I look when I have hiccups. Nobody believed how bad they were until I uploaded a video of it. Isn’t it sad about fruit? I’ve heard if you have fruit with meat, the protein will offset the affects of the sugar. I’ll have to try it. That reduction in measurements is awesome!